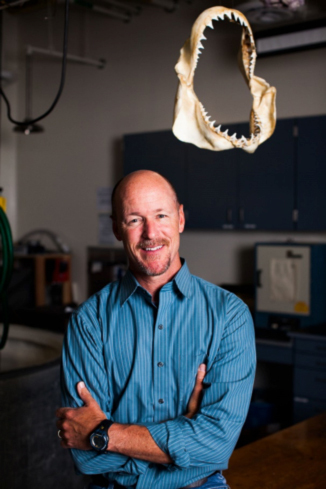 This guest blog comes from Dr. Chris Lowe, a professor of marine biology and the director of the CSULB Shark Lab. Despite the potential Discovery Channel royalties, it’s not easy being at the top of the food chain. Apex predators like sharks, that occupy the top of a food chain, are typically few in number because of certain characteristics (e.g. slow growth, low reproduction, delayed maturity and high longevity). And they are greatly dependent on animals lower on the food chain, thus dependent on the environmental conditions that support these food sources. Humans, the Earth’s reigning “apex predator,” are clearly an exception to this rule. The human population has grown exponentially, particularly along coastal communities, bringing with it a litany of impacts on our coastal ocean, including habitat loss, pollution and overfishing. Rapid coastal development in California back in 1940s-1970s, resulted in some of the worst coastal water and air quality that existed anywhere in the country. But since the 1970’s California has significantly improved water and air quality due to strict environmental regulations on discharge and emissions. In fact, California now has some of the most conservative environmental regulations in the country when it comes to water and air quality. As a result of strict regulations on waste water discharge, the state has cleaner water now than it did in the 1970s even with three times more people living along the coast. Yet, despite all of this legislation and regulation, we’re constantly bombarded with “doom & gloom” messages about the state of our ocean. Have any of those state and federal legislative and regulatory acts resulted in any net benefits over the last four decades? If I were to tell you things may be getting better, and the evidence for this is seen in the recovery of our marine predator populations — would you believe it? While it’s taken decades, many marine predator populations are increasing due to better water and air quality, improved fisheries management and a restoration of ecosystem function — all of which occurred regardless of an ever growing human coastal population. Over the last nine years, my students and I have studied juvenile white sharks off the coast of southern California as part of a collaborative effort with Monterey Bay Aquarium. Because newborn white sharks can be found in coastal waters off southern California, scientists hypothesize that this area is a nursery for white sharks in the Northeastern Pacific Ocean. Because of their protection through state (1994) and federal laws (2005), juvenile white sharks that get accidentally caught in gillnets are no longer being sold to fish markets and restaurants and many are instead being safely released back into the ocean. This steady increase in the number of young sharks being caught in the fishery since 1994 is likely attributed to population growth, which also suggests that conservation measures put in place to protect white sharks is working even with existing fishery interactions. Figure 1. 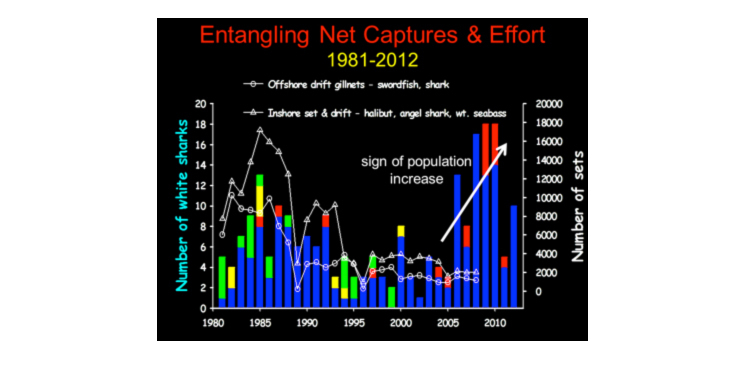 Number of white sharks reported captured in gillnet fisheries each year (left axis – bars). Number of gillnets set per year (right axis – lines and symbols). Blue bars represent white sharks less than 1 year old (< 6’ long), red indicate juvenile white sharks between 1 and 7-12 years old (6.5-12’ long), yellow indicates subadult and adult white sharks (over 7-12 years old, > 12’ long), and green indicates sharks of unknown size. Harbor seals, northern elephant seals, fur seals, dolphins, grey whales and blue whales have also shown similar dramatic come-backs resulting from protection. These population recoveries over the last 20 years have no doubt provided the adult portion of the white shark population with substantial food resources in coastal waters and have certainly enhanced the population’s ability to grow. The recovery of white sharks off California may be the best example of a conservation success story that we have to offer. It shows we can fix things, once we identify the problem, even with a growing human population. While there’s still a lot to be done for our ocean on a global scale, this is a testament to our collective desire and sacrifice for a cleaner, healthier ocean.